After assembling deep hive bodies, I painted them. I paint all my hives green because it is different than the standard white you see everywhere. I also think green helps the hives blend in better with their surroundings. My paint process is to start with the best water based exterior latex primer and paint I can find. I use a coat of primer because primer is less expensive than paint. Then I apply two coats of flat green paint. I like to put my honey supers and other beekeeping equipment on cardboard as a kind of drop cloth. I let them dry overnight in the barn between coats. 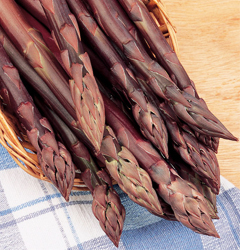 Why grow ordinary colored asparagus, when purple is available? I wanted to start an asparagus bed last year, but with the preparations for chickens, I put it off. It reminds me of the best time to plan a fruit tree…twenty years ago. The second best time is today. Yesterday, I spoke with the folks at Daisy Farms in Michigan. I ordered 25 of their purple passion asparagus. I will plant it in the square foot garden bed I weeded the other day. What color do you paint your hives? Do you grow asparagus? Let me know in the comments section below. Are you going to follow these asparagus instructions and not harvest until 2 years from now? Indeed. From what I have read it is important to let the bed get established. I will wait two year until harvesting the asparagus. That is why I wish I planted the bed years ago. The upside is (as mentioned in the pdf you linked) that as a perennial, the asparagus should produce for 15 years or more.